It's difficult to know where to start, when wanting to say something good about a book, without sounding trite or patronising. So let me relate a short story, which might tell you a little bit about Leiths Simple Cookery. My fourteen-year-old daughter is doing cooking in school. They don't call it that of course. It now comes under Design & Technology as we are talking Food Technology these days! What was wrong with good old plain cooking lessons? Anyway enough of that, her most recent project was to find and cook a vegetarian dish and naturally she thought she could take a short cut by asking me what she should cook! After I explained that it was her project I suggested that she did some research using the cooking books in the house (there are quite a few to choose from). She struggled. When I stopped to think about it the reason she was struggling was her lack of experience and the need to find something that did not require too many ingredients and would not take too long to cook and prepare. So with so many books in the house the task should have been easy! Not so. Look at most recipe books and you find that most recipes call for a lot of ingredients and many are far from simple to do. What was needed was something a bit more focused towards someone learning to cook . 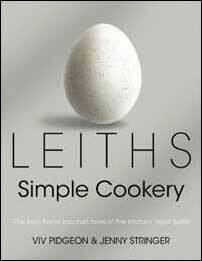 . . and then I remembered I had just received my copy of Leiths Simple Cookery. An enjoyable hour later she had found her recipe, which was both interesting and easy to prepare . . . it also led to me making my own tapenade for the first time! Far superior to what I had been buying in the supermarket - something I had just never thought to make. This book will provide recipes for your every need from simple starters through mains to delicious puddings and beyond. The all-important basic recipes are also included ensuring everything you need to know to prepare great meals is in one simple book! This is no pompous book speaking down to the less experienced but a good old fashioned cookery book, like everyone's mother used to have back in the days when people cooked real family meals and all sat around the table to eat them. Put together with a thoroughness that is rare these days it is a must for the kitchen library. It is well illustrated and explains all those different things you need to know. A great present for anyone who wants to learn to cook but also for those who want to improve their cooking and expand their experience. It is also ideal for those of us who are more experienced as it provides a reference book for forgotten techniques (or ones we failed to learn and are now too embarrassed to ask about) as well as an excellent source of recipes. Highly recommended - a must have for any kitchen.